"The Great Brit" Blog by Glenn Cameron: Time for a new digital camera with a flip touch screen? 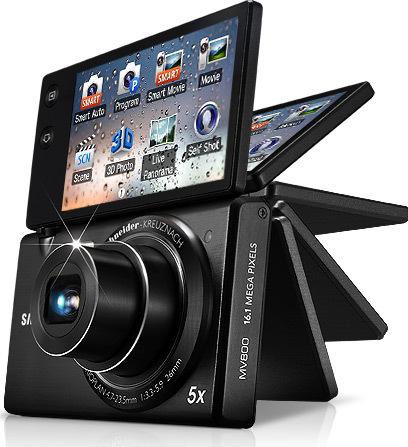 Time for a new digital camera with a flip touch screen? Had my Samsung ST500 for a couple of years now, been very pleased with the front display as I've travelled around with my better half we have managed to photograph ourselves at locations without the guesswork but the screen was small and not always great to see depending on lighting conditions. Excited to notice the new Samsung MV800 today which boasts a nice rotating flip-out display so now get a better picture in the "self-potrait" style shots but loads of other possibilities and interface looking a lot more sophisticated (no wonder Apple are suing Samsung for nicking their UI) so now just need to justify spending another crica £250 :-) Particularly interested in the 3D feature given I have a couple of Samsung 3D TVs at home, maybe that's the justification I was looking for! !